Today we learned how to say “thank you” and “you’re welcome” in Japanese! 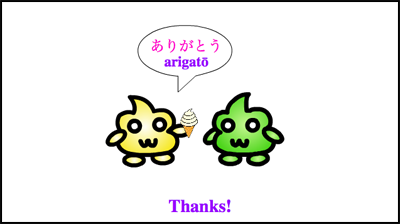 In this review, we will teach you a few other ways you can say “thank you” in Japanese! ★　A more casual way to say it is arigatō. You can use the casual version with friends and family, but you will want to use the more formal version with your teacher or boss. ★　Dōmo – This is the easiest, most casual way to say thank you in Japanese. ★　Dōmo arigatō (gozaimasu) – An extended formal version of the same expression. 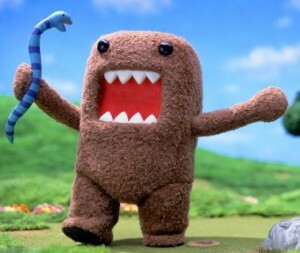 ★　Arigatō gozaimashita – This is the past tense of arigatō gozaimasu. 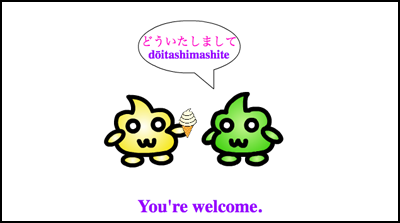 ★　Dōitashimashite means “you’re welcome.” This is a set phrase that can be used in either a formal or a casual situation. ★　Dōzo is most often translated as “please.” However, it is not always used the same way that please it used in English. In this video, we translated it as “here you go” to make it more easy for English speakers to understand. ★　Dōzo is often used when giving someone something or telling someone to go ahead or to take a seat. Today we learned several ways to say “thank you” in Japanese! We also learned the expression for “you’re welcome” in Japanese! Practice using these expressions with your friends! I’m a little confused about the past tense form, “ありがとうございました”. How does it differ from “ありがとうございます”? And in what sorts of situations would you want to use one or the other?